, which if approved, will see the business take a 15% stake in Network Ten, the free-to-air network's chief executive fronted investors to talk through the details of the move and outline what exactly it means for the two businesses. The deal not only affects investors but advertisers as well, with the deal outlining that as part of the partnership, Ten will take a 24.99% stake in the Multi Channel Network (MCN), which will see the sales teams of the two networks combined. The partnership also raised questions surrounding sports rights, as well as premium drama rights and with a 10% stake in Presto also up for grabs, what the network thinks of the SVOD space. The topic of sports rights played heavily in the investor call with AFL and NRL negotiations looming, and the continued debate around the inflated cost of sports rights. McLennan highlighted however that while sports rights are obviously valuable to the broadcaster, other shows such as Friday night's The Living Room “regularly beat Friday football” in ratings. “You can get big ratings without sport,” he said. “We like premium sport, obviously, and it rates well, but it comes at a cost. We’ve said consistently that we have two plans; one for premium sports and one without, so we;re not going to blow our brains out. We need to meaningfully participate, and we'll see how it goes,” said McLennan. Ten's sports programming has included the 2014 Winter Olympics, V8 racing and Formula One and Big Bash cricket, which he says the network is making money from. MCN will represent Ten’s television, catch-up and digital advertising sales. What wasn't outlined in the announcement was what this meant for the already existing sales team at Ten. Job losses are expected but how many is unclear. “Clearly by combining the teams and bringing two equal teams together, we are looking at having a stronger voice in the market and making it simpler for media buyers and advertisers to interact with us. We think its a highly differentiated offering, but we're not going to be drawn on people and head count now,” McLennan said. With sports and reality dominating programming conversations, drama is one area where a deal with Foxtel could provide Ten with a strong position over Seven and Nine. There is potential for a model that would see Ten and Foxtel co-fund and deliver drama content across both FTA and pay TV. “Reg approval for this deal to proceed and that's something we will obviously look at that – it is an opportunity. I think we've learnt a lesson from drama over 18 months and have a clearer view of what we think works. Shows like Offspring have been tremendously successful,” McLennan said. McLennan also outlined the portfolio of shows Ten has slated for the second half of the year and that the strategy to “reinvigorate” old formats at the same time as investing in new ones is paying off with “strong advertiser support around shows including new format show ** and The Bachelor as well as continued interest in Masterchef and My Kitchen Rules. FTA Vs SVOD - how will it play out? McLennan spoke positively about the broader FTA market, the challenges of a soft advertising market and the influx of platforms such as Netflix saying that it's not “Armageddon” despite what people think. McLennan expects today's SMI figures for May to show more advertising growth for Ten, taking share from Seven and Nine. "Advertisers want is greater access to data"
McLennan added that when it came for the network to announce its new offering to market it was important for the business to present something that was different, and while the sales team will be incentivised for driving growth and Ten's power ratio, its equally about leveraging Ten's premium video assets. “If you look at it holistically, premium video content is the most valuable video content in the market and we have lots of it and we're delivering more and more of it. “What advertisers want is greater access to data so they can make more informed decisions about how they spend their money, so when you combine the reach of Network Ten with the multi-channel offering from MCN you've got, in my opinion, a highly differentiated and powerful combined assets. So up against our competitors its completely unique and it stands alone in the market and we can offer highly targeted, broad reach marketing campaigns to those advertisers that are out there. “So relative to all our competitors; Google, YouTube, Facebook and other free to air to competitors, we think it's a really powerful consortium we're putting together,” he said. Not only is Ten looking to grow its share in the constant FTA battle between Seven and Nine, and move beyond its 40-40-20 compeititon with its rivals, it is also looking to benefit from advertiser's dissatisfaction surrounding digital inventory, and accountability of where their digital ads run online. “There's a growing sense that there's a complete lack of accountability with a lot of digital advertising that's out there at the moment,” McLennan said. “We provide premium content, and we're accountable, we're accountable across all these channels, so we're combining MCN with Ten to have a different offering that isn't really replicated in the market," he said. McLennan outlined that with this move Ten's strategy isn't just about protecting and growing its share it's about going after the “scatter money” that's coming out of digital. 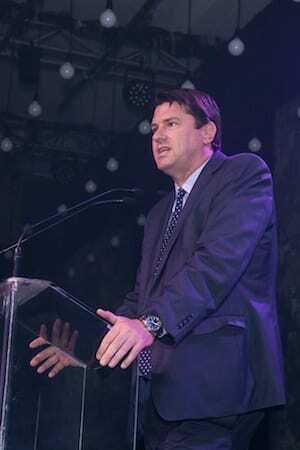 Ten Network Holdings executive chairman, chief executive and managing director Hamish McLennan. Fresh from the news that Foxtel has put forward a $77 million dollar offer, which if approved, will see the business take a 15% stake in Network Ten, the free-to-air network's chief executive fronted investors to talk through the details of the move and outline what exactly it means for the two businesses.